Sure, we could always take on a particularly advanced lace knitting pattern or try our hand at a much more intricate embroidery design than we’re used to, adding beads to keep things exciting. But for some reason we’ve just been obsessed with the idea of learning a new skill instead! We’d still like to keep things in the handicrafts and needlework department though, which limits our options a little bit. Imagine how excited we were, then, when stumbled upon the world of ribbon embroidery! Just in case you’re as intrigued as we were by the stunning concept of ribbon embroidery, here are 15 of the most beautiful and inspiring patterns we’ve come across so far! 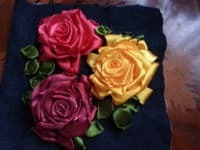 Perhaps this is going to be your very first ribbon embroidery project and you’re looking for tips and tricks for making it as easy on yourself as possible? 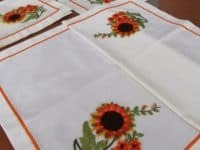 Well, one of the biggest challenges we ran into in the beginning of our exploits in this department was keeping whatever we were embroidering still and stretched so that we could make our pattern neatly, evenly, and with relative ease. At first, we experienced a lot of knotting and wrinkling that really got in our way! That’s why we were so grateful to find out that the same embroidery hoops we used for cross stitching are helpful here too! 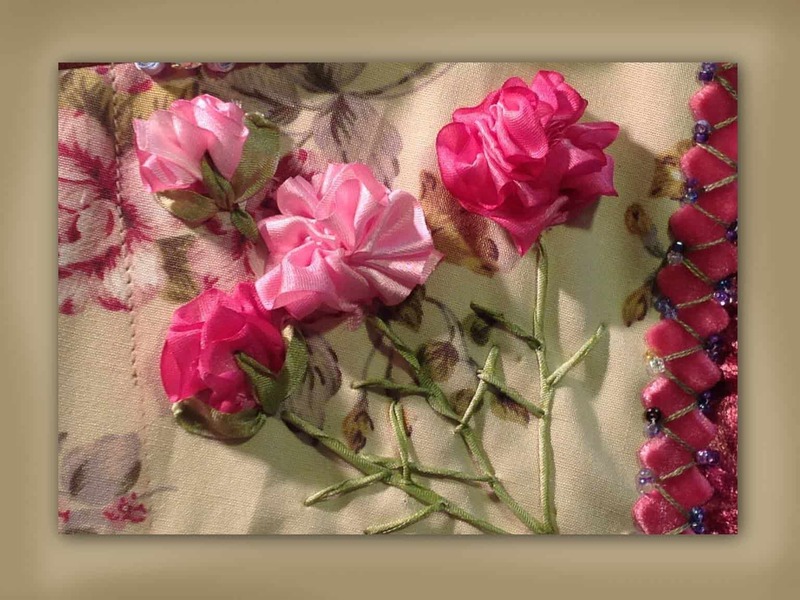 See what we mean in more detail on My Crafts. Have you been dabbling in ribbon embroidery for a little while now and you’re actually mostly on the hunt for new, simple techniques to try out so you can make the prettiest images possible? Then we absolutely think you should take a look at the way Leisha’s Galaxy made these beautiful little blossoms! They guide you through the process of using ribbon to make little looping leaves and spiralled rosettes that stand out wonderfully from your canvas. 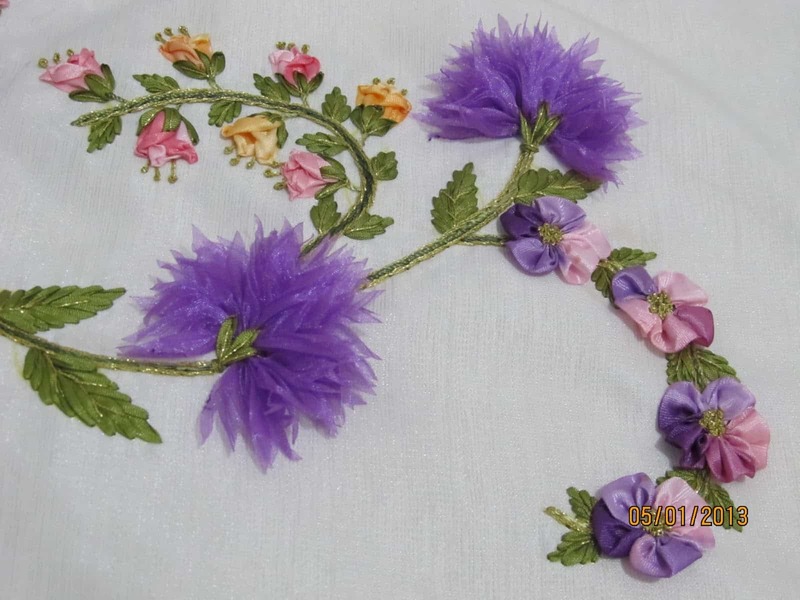 Now that you’ve looked at a couple of different designs are you feeling like perhaps you’re in over your head with the whole embroidery idea, since you’ve actually never really worked with ribbons before, period? Maybe you’re actually looked for an introductory ribbon craft that you can do with your kids so you can slowly start leading them towards learning how to do ribbon embroidery just like you. 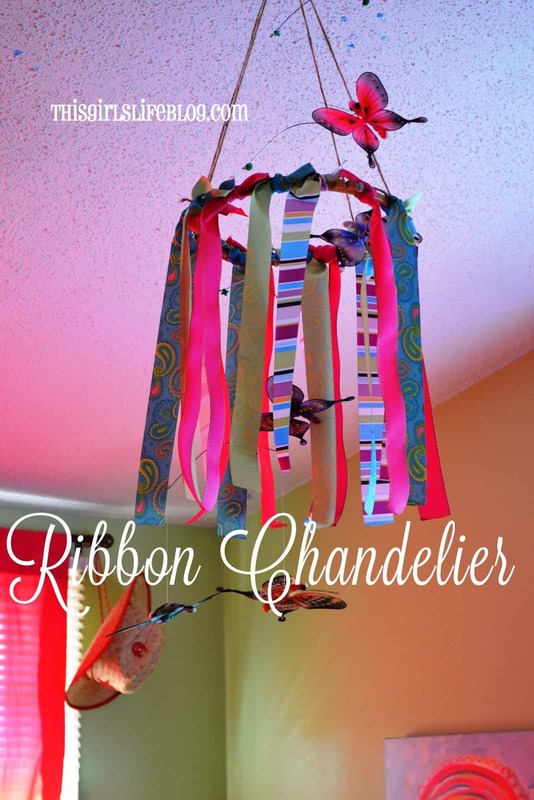 In that case, perhaps this cute little ribbon chandelier idea would make a good starter craft until you (or your kids) are ready for something a little more difficult. See how it’s done on This Girl’s Life. No matter what kind of textile or needle based craft we’re doing, we can’t help but feel like adding a bit of sparkle and pizzazz to a project every once in a while is a great idea. It keeps us interested and it’s also often a little more difficult to do, so we really appreciate the basics and simplicity of the regular designs we’re used to when we go back to them afterwards. This stunning pearl and ribbon embroidery idea featured on Pinterest is the perfect example of what we mean! We adore the way they replaced some of the rosettes in their pattern that would normally have been made of ribbon as well. 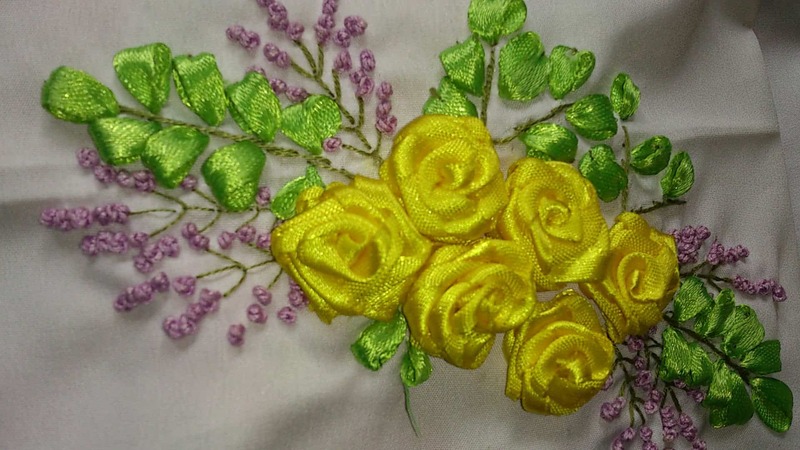 If you’re going to go to the trouble of creating an absolutely stunning hand embroidered piece, would you rather create that pattern on something that you made by hand entirely from scratch, so you feel really satisfied at the end of the project? 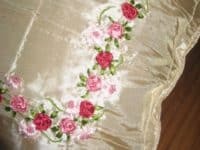 Then we’d absolutely suggest taking a look at how Euphoria Craftwork sewed themselves a beautiful silk pillowcase and embroidered flowers into that using ribbon. 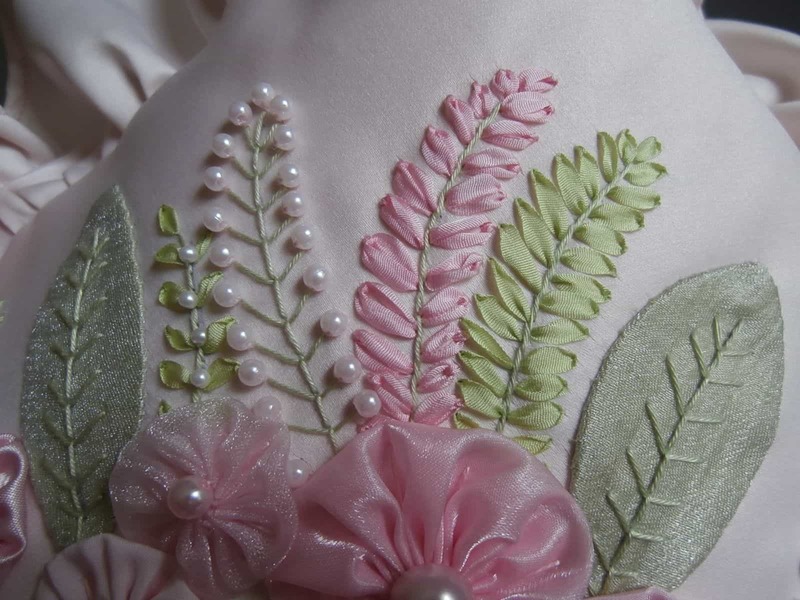 Did we really catch your attention when we started talking about different embroidery embellishment ideas that have some texture and will stand out from whatever you’re working on in a really pretty way, but you simply cannot stand working with beads? Well, we think they’re great, but we can totally understand how some people might find them a little too finicky to be enjoyable. Perhaps this idea for using small pieces of chiffon to create fun textured flowers would be a little more up your alley. Get the full tutorial for making these from Elvin Kurdela. Were you pretty intrigued by the idea of making small roses out of ribbon but you can’t help but feel like you know you’ll want to make bigger, more dramatic roses the moment you’ve finished the little ones because you really just love the idea that much? Well, start with the little ones just to say you did and once you’re finished, here’s a backup design from Arts and Crafts Club that will guide you through the process of making bigger ones! We love the layering technique they used to really give the roses body and volume, just like the real thing. Just because you’re using a technique that works well and looks good on fabric doesn’t mean you have to create things like pillow cases and textured cross stitch style pieces! 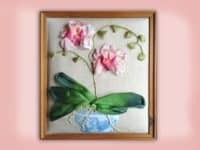 We happen to think that ribbon embroidery is a beautiful enough technique that it could easily be displayed on the wall like art. That’s why we were so happy to find this awesome canvas wall piece created by WN. 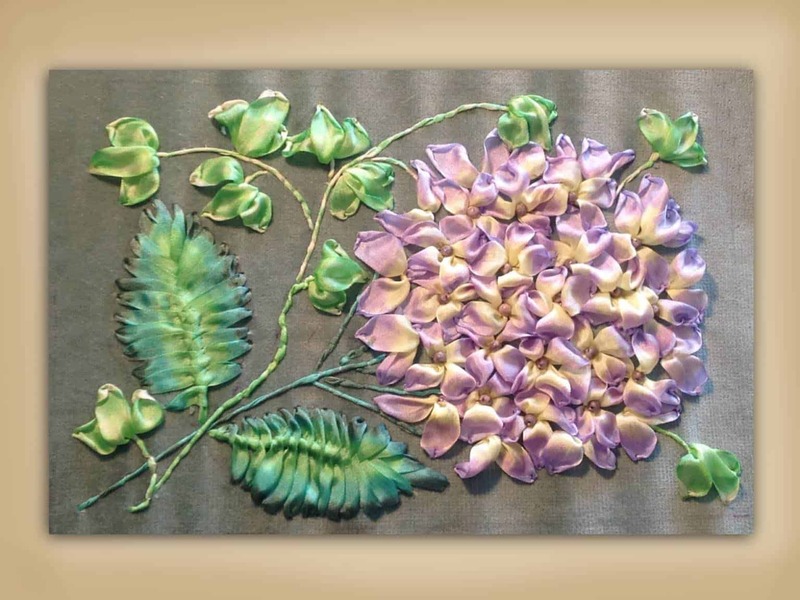 They show you how to capture the beauty of hydrangeas using silk ribbons. Similarly to the way knitting patterns often combine different stitches and stitch patterns in on design or garment, ribbon embroidery can actually do the same thing! 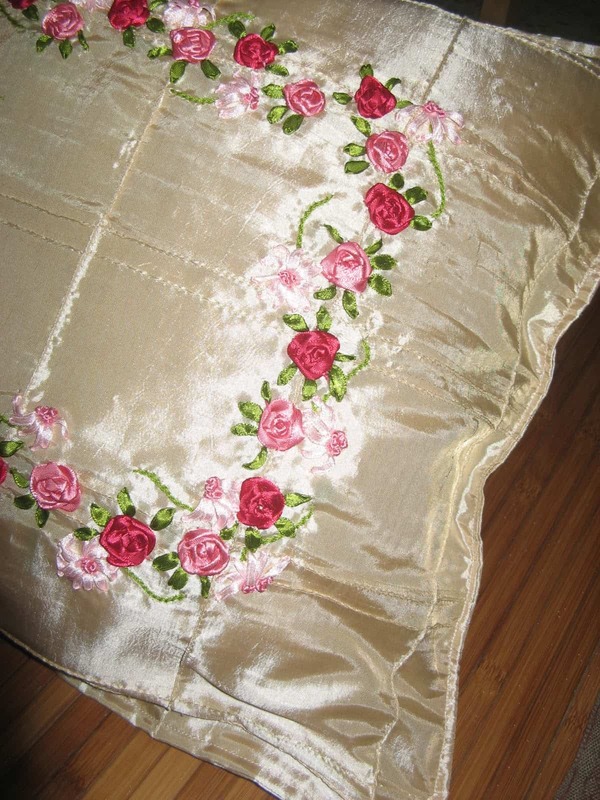 This stunning rose wall piece outlined on Needle Work is the perfect example of what we mean. They show you step by step how to create fluffy looping petals and how to twist your ribbon tighter in order to make lines for the stems. Perhaps you’re actually an extremely experienced needlepoint artist who has worked with all kinds of materials before and doesn’t feel intimidated by ribbons at all, so you’re looking for a pattern that’s much more advanced than what we’ve shown you so far? 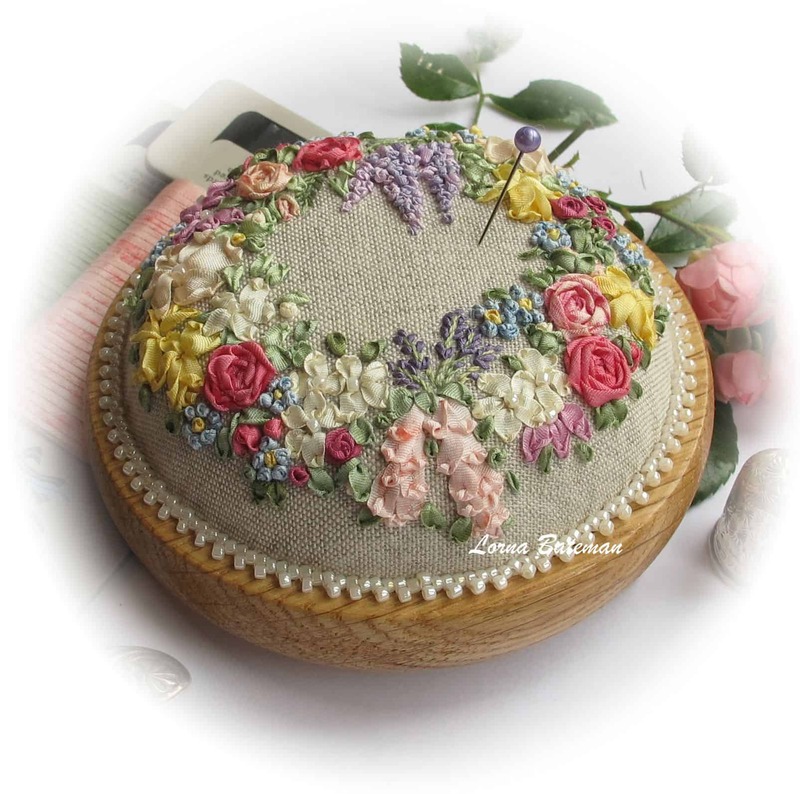 In that case, we absolutely think you’ll appreciate the beauty of this hand embroidered pin cushion made with ribbons and pearled beads. We can’t get over how stunning the tiny, differently coloured blossoms look in shapes that mimic all different types of real life flowers! 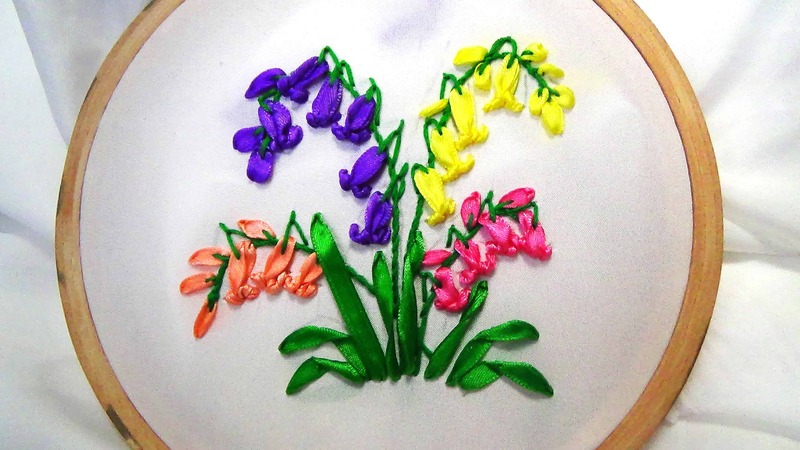 Get the full details of how to make each one on Lorna Bateman Embroidery. Do you find that you’re most interested in learning new techniques when you’re able to combine them with other kinds of art that you love creating as well? Then we think we’ve finally found the perfect idea for you! Crafty Attic shows you how to embroider a beautiful flower with awesomely unfolding leaves, each made from ribbon. Then they show you how to hand paint a lovely vase right on the canvas you just embroidered before you frame it! Have you always been the kind of person who loves sharing your artistic skills with your friends and family by giving them lovely little handmade gifts, so you’re always collecting ideas for very small things that you can make a few of without overworking yourself? Well, there’s no reason that ribbon embroidery can’t be one of the things you share with your loved ones! 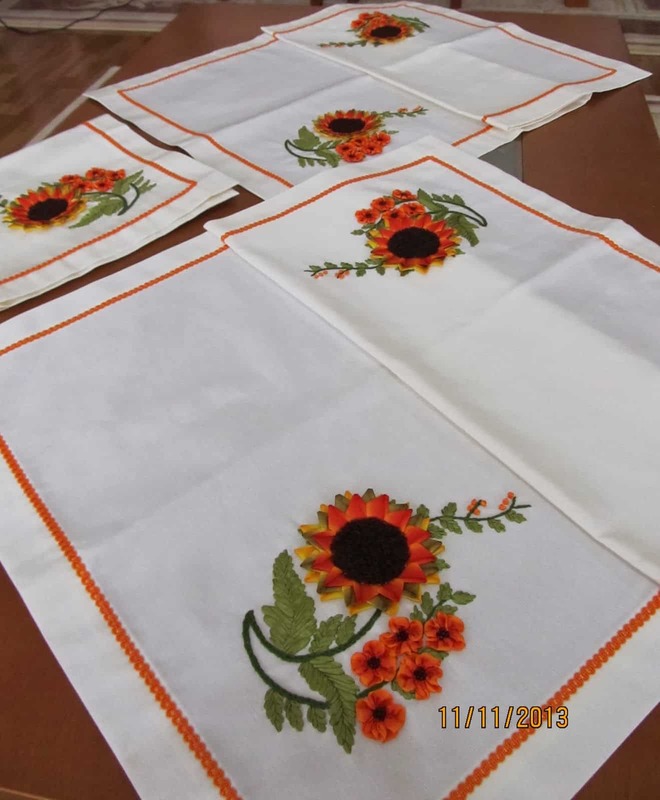 We completely adore these cheerful sunflower handkerchiefs hand embroidered using a pattern from Elvin Kurdela. Did we really catch your attention when we started talking about simple ribbon embroidery crafts that your kids might be able to try so they can make beautiful things right alongside you, but your kids are actually a little bit older and you think the ribbon chandelier idea we showed you earlier on our list might be a little too simple even for them? Then here’s an adorable idea that’s easy, cute, and lets them share their skills, just like you love doing! 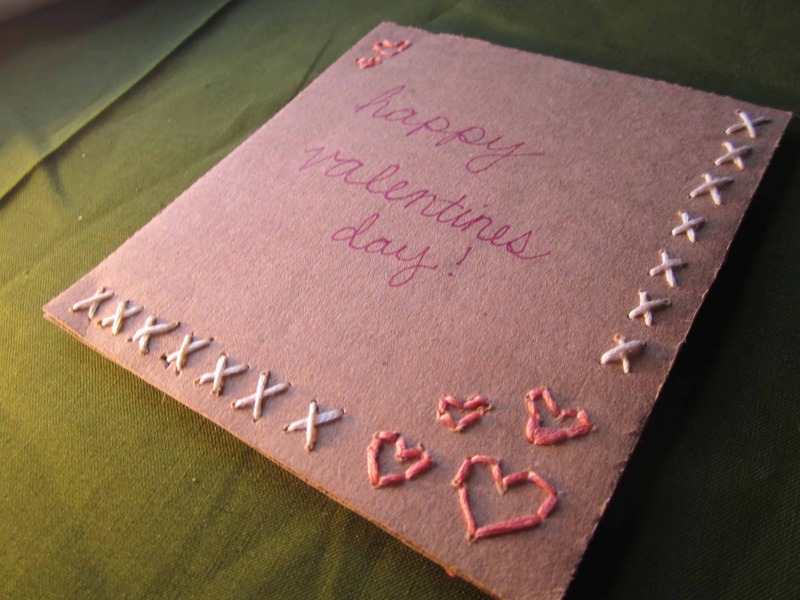 Too Crewel shows you how to twist ribbon around itself as you embroider very simple shapes like X’s and hearts to make a lovely Valentine’s Day card (or any greeting card for a loved one, if you ask us). 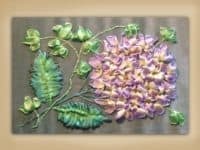 Have you recently created a beautiful ribbon embroidery piece that you’re actually really proud of an you’re looking for a way to show it off that will actually let people see it up close rather than just hanging it on the wall? We love that idea, but we also like the idea of keeping our handmade things protected so they don’t get ruined. 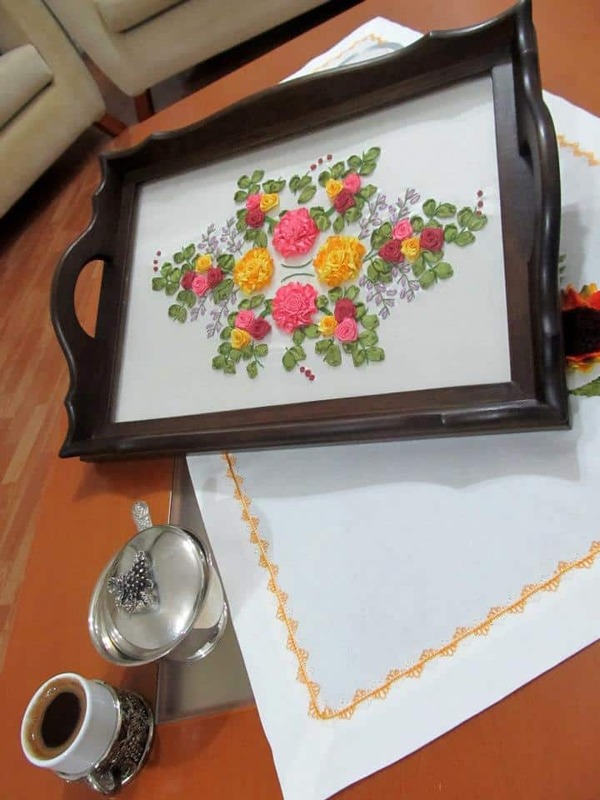 That’s why this stunning ribbon embroidery tea tray idea featured on Elvin Kurdela is the perfect compromise! 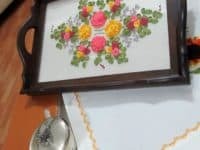 They show you how to make a lovely floral pattern but also encase it behind glass like it’s framed, even though you’ll be able to use the tray whenever you please. 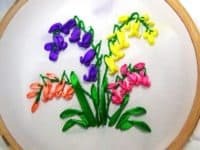 Rather than finding ribbon embroidery patterns that your kids can make themselves, would you rather find something cute that you can make for your kids? We love that idea too, but we also like the idea of making sure it’s something the kids can actually play with, rather than just staring at it while it hangs on their wall. 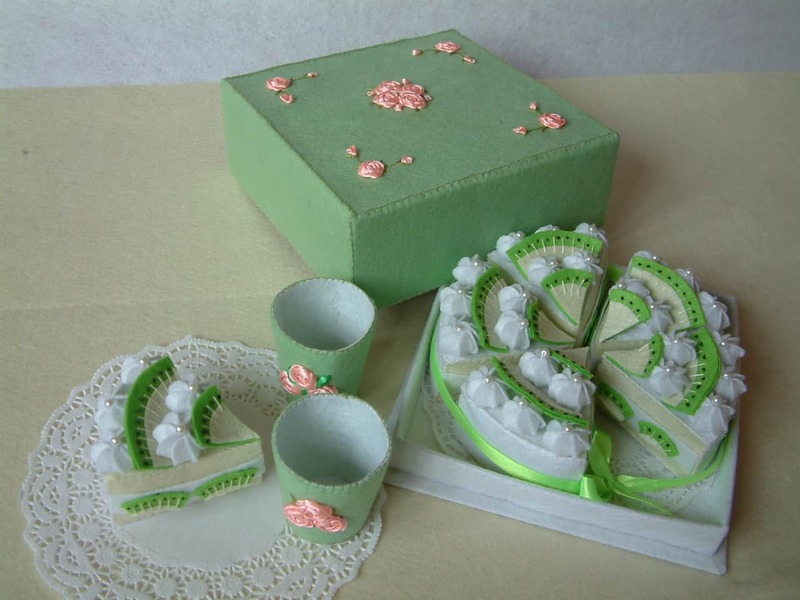 That’s why we thought this ribbon embroidered felt play set created by Fairy Fox was so incredibly adorable! They show you how to make tiny glasses and a whole pretend key lime pie with it’s own lovely box from scratch, as well as how to make it undoubtedly the prettiest toy your child has. The post Knitting Gorgeous Patterns: 15 Beautiful Ribbon Embroidery Designs appeared first on WonderfulDIY.